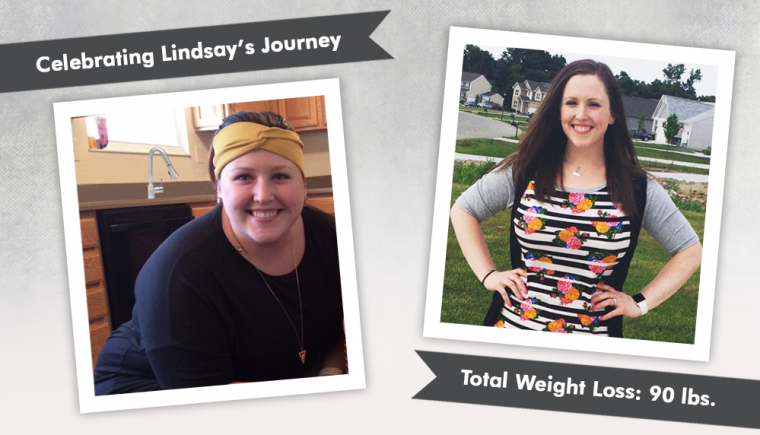 Celebrating Lindsay's Before & After RNY Gastric Bypass Journey! Weight loss, or the concept of it anyway, has felt to me like a full-time job for a long time. I remember being on my first self-imposed diet in middle school after I made the cheerleading squad and discovered my first stretch mark. I wasn’t obese at that time, but the idea that I had a single, shiny stretch mark made me feel like I was. I didn’t comprehend that it was just puberty and my six-inch growth spurt was to blame. When high school rolled around, I decided to lose weight. To impress a boy I liked, I wanted to become a vegetarian just like him. A few months of living on lunches consisting of green beans or corn got really old, really fast. And when I found out he had eaten chicken nuggets, I was crushed. I went back to eating whatever and whenever I wanted until my freshman year of college. I weighed 175 pounds my sophomore year of high school. I didn’t weigh myself again until the winter break during my first year of college. When I saw that the scale read 220 pounds, I couldn't believe it. When did that happen? My clothes were tighter but I still could fit into them. I walked a lot around campus but I was no longer playing softball, practicing with my competitive marching band, or cheering any longer, and it caught up with me. I vowed to pay more attention in the cafeteria and decided to eat only salad for all my lunches the rest of the year. That didn’t last long either. I went through a difficult break-up, met my now-husband, graduated from nursing school, and started working. I began my career as an operating room nurse and found myself on the cardiac surgery team – I loved it. I was starting to notice that I weighed more than the patients on the table. The thought of switching places with one of these patients scared me. I decided to run a marathon in my hometown of Columbus, Ohio, which happened to fall on my 26th birthday. What a cool way to celebrate the day by running 26.2 miles! I trained for 30 weeks and worked with a trainer. I spent all of my time running, meal prepping, and working. I crossed that finish line at my lowest adult weight. I had lost 60 pounds during that time, had gotten engaged a few weeks before, and life was good. By the time I went on my honeymoon, I had gained 10-15 pounds. I was tired of prepping all of my food and not eating with my friends and family – it wasn’t fair that I had to work so much harder at controlling my weight than everyone else around me! I didn’t see that my portions were out of control or that I really had a problem controlling myself around food. I was burnt out on running after all of that training but did enjoy Zumba and CrossFit classes. I even surprised myself and only a few weeks into CrossFit in 2015 and signed up for the CrossFit Open with my gym. I completed each weeks’ workout and was so proud of myself. The last week of the Open, my father passed away after a 21 year battle with Huntington’s disease – a genetic, neurological condition that affects a person's ability to walk, talk, think, and reason. Any child who has a parent affected by Huntington’s has a 50/50 chance of inheriting the disease. I had spent the majority of my life caring for my father; the last few years he spent in a nursing home, and I was three hours away and didn’t get to make the trip to see him as often as I would have wanted. No matter how prepared you think you are for something like this, it knocks the wind out of you. I was crushed. I spent the rest of 2015 gaining every pound back that I had lost, plus some. I felt horrible about myself and didn’t know what else to do that I hadn’t done before. I was so tired of this other full-time job I had in my own weight loss. I had a friend who had undergone the Vertical Sleeve Gastrectomy procedure and told me how it changed her life. I started doing research and found the UC Health Weight Loss Center. I signed up for a seminar to hear my options and told my husband that I was going and would appreciate if he would come with me. I knew if I was going to do this it would affect him too, and I wanted him to hear everything I was going to hear. Total Weight Loss: 90+ pounds and still losing! I was so nervous walking into that seminar. Dr. Brad Watkins, the surgeon, gave a wonderful presentation on the surgical options and the process of being approved and preparing for surgery. I was impressed by how thoroughly he answered everyone’s questions and I felt like he really cared about the people in that room. As a nurse, I’ve worked with enough surgeons to know that their time is valuable and they aren’t always the most patient people, but Dr. Watkins was. The next day, I found out my procedure would be covered by my insurance and was scheduled for my initial assessment shortly after. There were several appointments that I had to attend prior to getting my official approval, and I have nothing but rave reviews for everyone in the Weight Loss Center. From the receptionist to the medical assistant to the patient advocate, everyone was fabulous and always made me feel like I was important. The day before Thanksgiving I found out that I was approved for surgery. It was scheduled for January 25, 2016. My surgical experience was fantastic – so much so that I’m now a nurse at the hospital where I had my procedure done. I work with Dr. Watkins almost every week, and he is just as nice to me as a coworker as he was when I was his patient. I am almost one year post-operatively and have lost 90+ pounds and am still losing weight. I have done everything the Weight Loss Center has asked me to do: I work out five days a week, and I’m back into running and training for my 13th half marathon. My life is so different now – food does not have the power over me that I now realize it used to. Finally, after so many years, I don’t feel like weight loss is another full-time job. I feel like I finally have control and am able to be the person I have always wanted to be. I couldn’t be more thankful for this tool that has helped me make the necessary changes in my life to be healthy. For that, I am forever grateful. Share Your Before & After Success! Celebrate your own Before & After WLS Success, milestones, non-scale victories, and inspire others! The OH team wants to hear from you to share your weight loss surgery journey. Visit our Before & After Submission page for details. 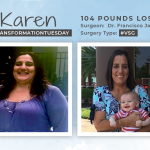 Before & After VSG with Karen, losing 104 pounds! 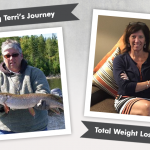 Before & After VSG with Terri, losing 120 pounds! 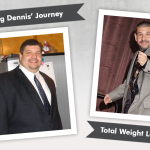 Before & After VSG Gastric Sleeve with Dennis, losing 194 pounds!